A year ago I had the opportunity to stage for three days at Addison Restaurant in the Grand Del Mar. During lunch one day I asked Chef William Bradley who (other than Thomas Keller) are the chefs he most respects. 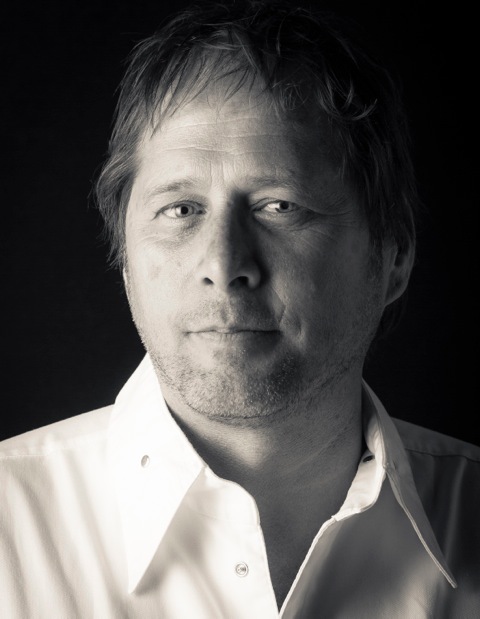 One name came up immediately: Chef David Kinch of Manresa Restaurant in Los Gatos, California. 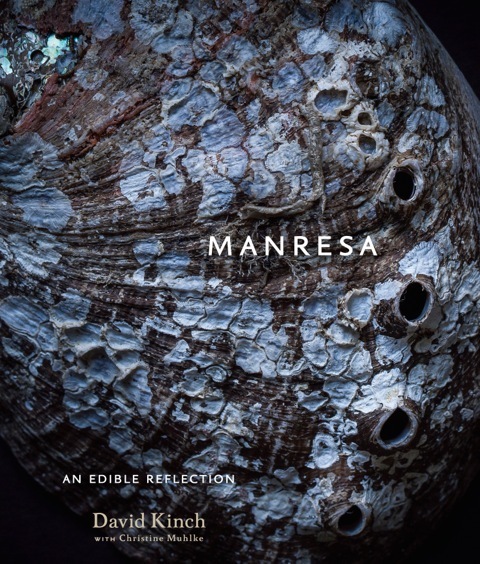 I have not yet had the opportunity to eat at Manresa, but a reading of his first cookbook, Manresa: An Edible Reflection, has only whetted my appetite to do so. Kinch will be in town this weekend as the next chef and author at the Good Earth/ Great Chefs Series at the Chino Farm on Sunday, November 10, 2013 from 11am -1pm, featuring that cookbook. This book signing and culinary event will include small bites inspired by Kinch’s recipes and the seasonal produce at the Chino Farm, along with beer pairings from local craft brewer Steven Strupp of Rule of Thumb Brewing Co., and caramel samples from the Caramel Collective. Harvest a good armful of nasturtium flowers. Separate at least 100 grams (2 cups) of the petals from the stems, as well as a handful of unopened buds and a few tender leaves, and reserve for the Nasturtium Butter and for serving. Place the stems in a large bowl and cover with the water. Seal the bowl with plastic wrap and allow the flavor to infuse in the refrigerator for 24 hours. Strain; discard the stems. Slowly heat the Nasturtium Stock to 120°F (50°C). Combine the warm stock, nasturtium petals, and butter in a blender and blend until smooth. Strain the sauce and season to taste with lemon juice and sea salt. In a small saucepan, bring the Nasturtium Stock to just below a simmer. Remove from heat and keep warm. high heat. Add the leeks and cook for about 2 minutes, stirring, until soft and translucent. Add the garlic and cook for about 30 seconds, until fragrant. Add the rice and cook for about 2 minutes, stirring constantly, until opaque and the grains start to sizzle and stick together. Add the wine and cook, stirring, until the rice completely absorbs all the liquid. Frequently season with a pinch of salt during the cooking process. Reduce the heat to low, add enough of the warm stock to cover the rice, and cook, gently shaking the pan and stirring constantly. Add more stock, 120 grams (1/2 cup) at a time, as it is absorbed. After about 20 minutes, with the rice nearly al dente, switch from adding stock to adding the Nasturtium Butter. When the risotto has a porridgelike consistency, remove it from the heat and fold in the cheese. Season to taste with salt. 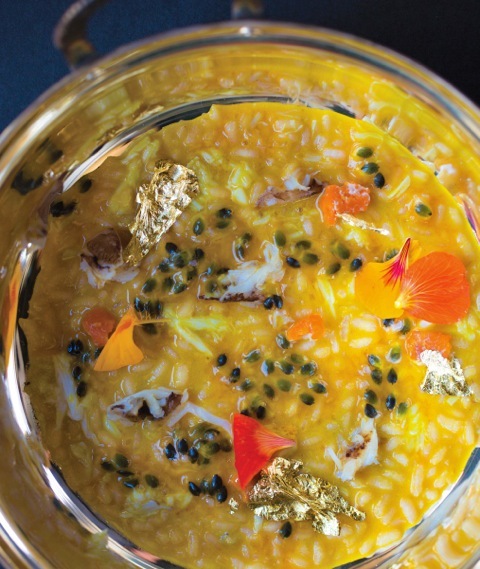 Mix the Nasturtium Risotto with a little of the crabmeat and a few nasturtium leaves. Spoon a shallow layer of risotto into individual bowls. Top each serving with more crabmeat, 2 or 3 sheets of gold leaf, and several spoonfuls of passion fruit seeds. Finish with the nasturtium petals and buds.